If you are a fan of dutch oven cooking, then this is definitely the cookbook for you! 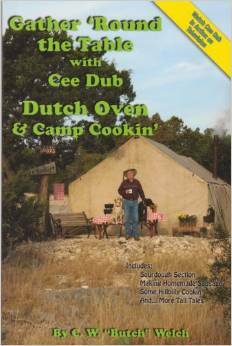 The author, Cee Dub, is an expert at dutch oven cooking. As a game warden in Idaho's back country, Cee Dub spent 30­plus years perfecting his dutch oven cooking skills. In 1999, he became the host of the first­ever dutch oven cooking show. Cee Dub and his wife, Penny, also run a website, www.ceedub.com, where they sell over 200 products related to outdoor cooking. He is the author of five cookbooks. This particular cookbook focuses on healthier dutch oven recipes. In his own words, Cee Dub says, “Many of the recipes we’ve chosen are 'lighter' recipes, we’ve included sources for obtaining nutritional information, and we’ve provided instructions on “down­sizing” your favorite recipes as well. But like anyone who enjoys a variety of dishes, we have included a few 'gut busters' as well.” (As a side note, Cee Dub encourages readers to explore the nutritional content of the recipes and sites www.dvo.com as his favorite website/software for obtaining nutritional information). Not all of the recipes in this cookbook are made in the dutch oven, but all are geared toward outdoor cooking. There are “Words of Wisdom” throughout the cookbook with helpful hints as well as fun stories and pictures. Whether you decide to make a dutch oven Breakfast Casserole, Sourdough Chicken­Fried Steak, or a Raspberry Lemon Dump Cake, you won't be disappointed. There are so many great recipes in here that the hardest part will be choosing what to make!